Coco Barrington was born into a legendary Hollywood family: her mother Florence is a mega-bestselling author, and her sister Jane is one of Hollywood's top producers. Jane has lived with her partner, Liz, for ten years, in a solid relationship. Florence, widowed but still radiant, has just begun a secret romance with a man twenty-four years her junior. And Coco, a law school dropout and the family black sheep, works as a dog walker, having fled life in the spotlight for the artsy northern California beach town of Bolinas. When Coco reluctantly agrees to house-sit in Jane's luxurious home, it turns out Jane's house comes complete with an unexpected houseguest: Leslie Baxter, a dashing but down-to-earth British actor who's fleeing a psycho ex-girlfriend. Their worlds couldn't be more different. The attraction couldn't be more immediate. Suddenly Coco is seeing things differently: Leslie is not just a celebrity, he's a single dad to an adorable six-year-old girl. Her mother is a woman in love, with vulnerability and new insight. And Jane and Liz are about to take the bravest plunge of all - into parenthood. As Coco contemplates a future with one of Hollywood's hottest stars, as her mother and sister settle into their lives, old wounds are healed and new families are formed - all bonded by love. With wit and intelligence, Danielle Steel explores love in all its guises, taking us into the lives of three unusual but wonderfully real couples. 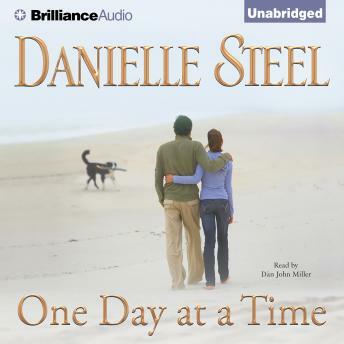 One Day at a Time is at once moving, thought provoking, and utterly impossible to put down.